Thank you for reading this and doing further research about Invisible Children (IC) and KONY 2012. Since the film was released on 5 March 2012, there has been an explosion of interest in Joseph Kony, the KONY 2012 film, and Invisible Children. Hundreds of thousands of people have come out in support of the film’s intention of raising support for the arrest of Joseph Kony. There have also been some criticisms—many of which are based on outdated sources, false “facts,” and misinformation. This page seeks to set the facts straight and briefly answer the most common questions about this very complex issue. Make the world aware of the LRA. This includes making documentary films and touring them around the world so that they are seen for free by millions of people. Channel energy from viewers of IC films into large-scale advocacy campaigns to stop the LRA and protect civilians. Operate programs on the ground in LRA-affected areas that focus on protecting communities, supporting LRA victims and post-conflict reconstruction. We spend roughly one third of our money on each of these three goals. This three-pronged approach is what makes Invisible Children unique. Some organizations focus exclusively on documenting human rights abuses, some focus exclusively on international advocacy or awareness, and some focus exclusively on on-the-ground development. We do all three at the same time. This comprehensive model is intentional and has proven to be very effective. 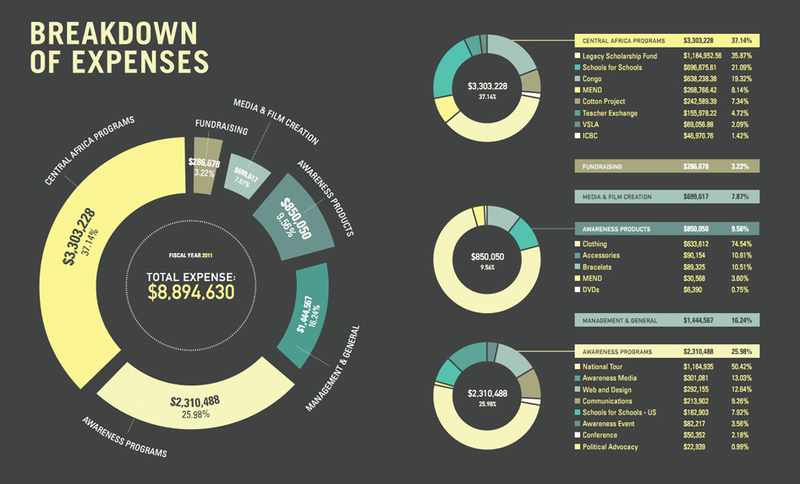 How does Invisible Children manage its finances? Where can I see Invisible Children's financial statements? Is Invisible Children independently audited? What are the rules for nonprofits regarding lobbying? What is the strategy to end the LRA threat? What have been some of the results of Invisible Children's advocacy efforts thus far? Does Invisible Children work with the Ugandan government or its military? Has Invisible Children's advocacy strategy considered Peace Talks? Why does this conflict require an international response? How does Invisible Children decide which programs to implement and which advocacy messages to focus on? What is Invisible Children's stance on the anti-homosexuality bill in Uganda? Is Invisible Children a religiously-based organization? Why draw attention to Joseph Kony and the LRA of all the human rights crises around the world? Why focus on Joseph Kony in particular? Is the LRA in northern Uganda? Where are Joseph Kony and the LRA right now? Why is it so difficult to capture Joseph Kony? Is Joseph Kony still alive? How do we know? Are Ugandans for or against the KONY 2012 campaign? What is Invisible Children's status with Charity Navigator and Better Business Bureau? Why does Invisible Children have a 3/4 star rating on Charity Navigator? Why is Invisible Children not involved in the Better Business Bureau? What is Invisible Children currently doing on the ground in DR Congo, Central African Republic, and South Sudan? What is Invisible Children doing on the ground in northern Uganda? We are committed, and always have been, to be 100% financially transparent and to communicate in plain language the mission of the organization so that everyone can make an informed decision about whether they want to support us. This video by CEO Ben Keesey details Invisible Children's development philosophy and finances. In FY2011, Invisible Children spent 80.46% on programs that further our three-fold mission of awareness, advocacy, and on-the-ground development; 16.24% on administration and management costs; and 3.22% on direct fundraising. (In the U.S., the fiscal year begins July 1 and ends June 30). Invisible Children's financial statements from the last 5 years, including our IRS Form 990 are available online for everyone to see: www.invisiblechildren.com/financials.html. Below is a screen-shot from pages 35 and 36 of Invisible Children's annual report, detailing total expenses for Fiscal Year 2011. Yes, Invisible Children has been independently audited by the outside accounting firm of Considine and Considine since Fiscal Year 2006, and all of our audits have resulted in unqualified opinions on the audit reports. An unqualified opinion means that the auditors believe the financial statements are "free of material misstatement and are in conformity with generally accepted accounting principles of the United States." Federal laws allow, and even encourage, charities to lobby within certain specified limits. Invisible Children has been careful to stay within these legal limits. Each year, as part of our Form 990, we submit an additional schedule that provides the financial details of these activities. We have also elected 501(h) status--part of which is a commitment to continue to voluntarily report our lobbying expenditures to the IRS. The Invisible Children Form 990 and audited financials for the past several years can be found on our website at: http://www.invisiblechildren.com/financials.html. The KONY 2012 campaign is calling for governments around the world to take part in a comprehensive approach to end the LRA threat to communities and to support regional governments in the effort to protect civilians and apprehend LRA leadership. This approach should include four main pillars (1) the protection of civilians, (2) the apprehension of LRA leadership, (3) the facilitation of the peaceful surrender of LRA combatants and (4) support to rehabilitation efforts for communities and individuals affected by the LRA. The protection of civilians should be a top priority of this effort and should include wider peacekeeping efforts in the region and the expansion of civilian early-warning networks. The apprehension of top LRA leadership will require cross-border coordination between regional governments and UN missions and will require increased intelligence and logistical support. DDR/RR (Demobilization, Disarmament, Repatriation, Resettlement, and Reintegration) efforts, including the use of "come home messaging" via FM radios and flier distributions in the region, have already resulted in successful surrenders. Efforts to complement current DDR/RR initiatives should be expanded to peacefully diminish the LRA threat to civilians. To address the immense levels of trauma that communities and individuals have suffered at the hands of the LRA, efforts should also be expanded to reintegrate formerly abducted children into their communities and assist those suffering from trauma. In 2008, our advocacy efforts, together with those of a coalition of international advocacy organizations, resulted in US support of the Juba Peace Talks between the LRA and the Government of Uganda. Specifically, efforts prompted the U.S. appointment of a Special Envoy to support the talks. In 2009 and 2010 we directed our advocacy efforts towards the passage of the LRA Disarmament and Northern Uganda Recovery Act. Our advocacy is informed by experts in the field and our relationships with leaders in LRA-affected communities. Advocating in the public policy arena is critical to achieving our advocacy goals, and we lobby within the limits of our 501(c)3 tax-exempt status. We are not a lobbying organization, nor are we affiliated with any political party. None of the money donated through Invisible Children has ever gone to support the government of Uganda or any other government. Yet the only feasible and proper way to stop Kony and protect the civilians he targets is to improve the efforts of regional governments, which we are advocating for, not supporting monetarily. The Ugandan military (UPDF) is a necessary piece in counter-LRA activities. No other LRA-affected country has a military that is equipped and competent enough to engage with the LRA. The UPDF has a solid understanding of the LRA's tactics and methods of movement, and has developed working relationships with South Sudan and Central African Republic in combined efforts to stop LRA violence. The UPDF has reduced the size and strength of the LRA prodigiously. Invisible Children does not defend any of the human rights abuses perpetrated by the Ugandan government or the Uganda military (UPDF). Any international support to the UPDF should be conditioned on the UPDF improving its human rights record. International attention focused on the UPDF in its counter-LRA activities will be a step towards ensuring that human rights abuses are reported and the perpetrators held accountable. Over the last 26 years, Kony has derailed multiple attempts to negotiate a peaceful end to the violence. He has repeatedly abused peace talks as an opportunity to regroup, restock, and abduct new recruits. Most recently, the LRA engaged in the Juba Peace Talks with the government of Uganda from 2006-2008. Joseph Kony had multiple opportunities to sign the Final Peace Agreement, but he failed to show up each time. The LRA is able to surrender peacefully at any time if they choose to do so. And not only are they "allowed to,"but there are systems in place to facilitate the surrender of LRA combatants. The LRA started in Uganda, but it left in 2006 and entered South Sudan, DR Congo, and Central African Republic. The LRA is presently active in three countries, and regional governments have been unable to capture Kony or bring him to justice because they lack the specific capabilities that would allow them do so. In 2005 Joseph Kony was the first person to be indicted by the International Criminal Court (ICC) for crimes against humanity and war crimes. The LRA is an international scourge, and stopping him will require an international response. For a more complete explanation of the KONY 2012 political goals, please see this letter to President Obama. Invisible Children's programs in Uganda, DR Congo, and Central African Republic are implemented with continuous input from local communities and their leaders. In Uganda, we learned very quickly that a top-down, Western approach was not the answer, and that local solutions were needed to fill critical humanitarian gaps. It is for this reason that over 95% of IC's leadership and staff on the ground are Ugandans on the forefront of program design and implementation. In DR Congo, Invisible Children works with the Commission Diocesaine Justice et Paix (CDJP), supporting projects that have been identified as priorities by local partners and that are responsive to local realities and needs. Invisible Children meticulously monitors and evaluates the impact of its work on the ground, partnering with Princeton in Africa and employing qualified monitoring and evaluation professionals. Invisible Children believes in the equality of all people around the globe and is in no way an anti-gay organization. We stand firmly against any form of the the Anti-Homosexuality Bill that has been proposed in Uganda, and commend the tremendous progress the Ugandan LGBTI community has made in showing the world that gay rights are indeed human rights. We are deeply saddened and troubled by recent attempts by some to associate Invisible Children with a pernicious anti-gay worldview. We believe that hate in any form is detrimental to our mission and that the liberty of all human beings is bound together. A personal statement from Invisible Children's Vice President of Business Operations. Invisible Children is not a religiously-based organization. We celebrate the fact that our staff is made up of people from diverse backgrounds and belief systems. Throughout our history, many staff and supporters have shared their personal motivations for working on this important issue. While we encourage everyone to share their own story, the personal beliefs of any one staff member, volunteer, or supporter are not reflective of the organization as a whole. Because of our inclusive approach, we have garnered support from people and organizations on all sides of the social, religious, and political spectrums over the last nine years. We are united, not in our religious or political beliefs, but in our desire to see an end to LRA violence. Invisible Children's founders came across this particular crisis in 2003 and felt impelled to act. They had intended to document what was happening in southern Sudan (now South Sudan), but instead found a conflict in northern Uganda that they had never heard reported in mainstream Western media. They spoke to children who lived in daily fear of being abducted or killed by the Joseph Kony and his Lord's Resistance Army. On that same trip, they met Jolly Okot Andruvile, who introduced the founders to the context of the conflict and convinced them that education was the best way forward for the youth of northern Uganda. Jolly is now Invisible Children's Country Director in Uganda. In 2005, the founders released their first documentary, Invisible Children: Rough Cut, about what they witnessed in northern Uganda. Between then and the release of KONY 2012, they produced nine additional documentaries. The LRA crisis is not "more important" than other human rights abuses, but it is the one that KONY 2012 aims to permanently end. We say that it requires an urgent response with the full conviction that many other injustices also require an urgent response. Our goal is that the apprehension and subsequent trial of Kony and his top commanders will set a precedent for how conflict and mass atrocities are dealt with in the future. Joseph Kony is the founding leader of the Lord's Resistance Army. While the LRA command structure has become somewhat decentralized since the LRA's move out of Uganda and into DR Congo, the Central African Republic, and South Sudan, Kony remains the group's supreme commander. He has been, and continues to be, the public face of the LRA. Removing Kony from the battlefield is crucial, but that alone will not end the LRA threat absolutely. His top commanders, two of whom are also indicted by the International Criminal Court, hold semi-autonomous power, and any comprehensive strategy to end LRA violence should include their arrest. No. The LRA left Uganda in 2006 when the Juba Peace Talks began. The KONY 2012 film makes this clear (at 15:01), but perhaps not clear enough. Joseph Kony and the LRA are currently active in DR Congo, Central African Republic, and South Sudan. Since 2008, the LRA has killed more than 2,600 people, abducted at least 4,000, many of whom are children, and displaced 440,000 in DR Congo, South Sudan, and the Central African Republic. The LRA weaves between the borders of these three countries, but in December 2011 an escapee reported that Joseph Kony was active with a group of LRA combatants in the area north of Rafai in the Central African Republic. The LRA Crisis Tracker maps LRA attacks in near real time. Joseph Kony purposely operates in the remotest corners of DR Congo, Central African Republic, and South Sudan, regions of these countries where governance is extremely weak. By weaving between borders and taking advantage of the dense jungle that makes it so difficult for their pursuers to track them, the LRA have become experts of evasion and survival. There is little to no communication or transportation infrastructure in the region where the LRA is active. Because of this, it's been difficult for attacked communities to call for help, let alone receive help in a timely fashion. It's been reported that Joseph Kony, as a precaution, has forbidden the LRA from using mobile communication devices in favor of hand-delivered messages. Joseph Kony is presumed alive by all international actors in the region. There is little to no doubt on that fact. On 2 December 2011 an abductee escaped into a town in the Central African Republic and, according to the United Nations, the boy reported that Joseph Kony was alive in southeastern CAR and was aware of the US military deployment in the region. This corroborates with information received from the United Nations and Invisible Children's partners in the region. As everywhere else, reactions are mixed. Just as with any country or continent, it is dangerous to characterize the Ugandan nationality categorically. KONY 2012 has evoked a variety of responses from people all over the world—many positive, but some critical. The same is true within Uganda. We have found that many Ugandans welcome the film's message of stopping Joseph Kony, but some take offense at how the message was delivered. Admittedly, KONY 2012 was geared towards young, western audiences in an effort to raise awareness of what began in Uganda, but is currently taking place in DR Congo, Central African Republic, and South Sudan [http://vimeo.com/38406755]. Charity Navigator is a third-party organization that assigns numerical scores to the work and effectiveness of nonprofit organizations. They give Invisible Children's Financials the highest score of four stars. Because Invisible Children has four independent board members instead of five, Charity Navigator gives us two stars in the category of Accountability and Transparency. We are interviewing potential board members and will add an independent member this year in order to regain our four-star rating by 2013. Invisible Children has, in fact, been independently audited by the outside accounting firm of Considine and Considine since Fiscal Year 2006, and all of our audits have resulted in unqualified opinions on the audit reports. An unqualified opinion means that the auditors believe the financial statements are "free of material misstatement and are in conformity with generally accepted accounting principles of the United States." In a lengthy article, Charity Navigator responds to the "mischaracterization" of Invisible children's "financial health" by saying, "We give the charity 4 out of a possible 4 stars for its Financial Health. It spends upwards of 80% of its budget on its programs and services. As such, Invisible Children is actually outperforming most charities in our database in terms of how it allocates its expenses." The article also corrects the rumor that Invisible Children isn't independently audited: "Some have quickly looked at our rating for Invisible Children and mistakenly concluded that the charity did not complete an annual audit. That is not true. What we report is that the charity's audited financials were prepared by an independent accountant, but that it did not have an audit oversight committee." Participation in BBB's program is voluntary--we are choosing to wait until we have expanded our Board of Directors, as some questions hinge on the size of our Board. The current Board is small in size and reflects Invisible Children's grassroots origins. We have now reached a juncture of success that has astonished even our greatest supporters. While it is important to retain a presence on the Board that reflects Invisible Children's early beginnings, we are also working to expand it this year. While the vast majority of the recent exposure and commentary about Invisible Children has been directed towards the awareness portion of our mission, below is a summary of our work in Central Africa--an equally important element of our mission. Invisible Children is committed to supporting communities affected by the Lord's Resistance Army by empowering local leaders to implement programs that have a lasting impact. In DR Congo and the Central African Republic we are working with local partners to protect communities, encourage peaceful LRA surrenders, and support the victims of the conflict. To address the lack of information from the most vulnerable and remote communities, Invisible Children partnered with Commission Diocesaine Justice et Paix (CDJP) [http://vimeo.com/28082679], led by Abbe Benoit, an internationally recognized Congolese human rights advocate for LRA issues, to expand an Early Warning Radio Network connecting communities to one another through twice-daily security and humanitarian reporting. This network utilizes high frequency radios to allow for advanced warning of LRA activity. It also provides the humanitarians that are delivering life-saving services and the groups involved in civilian protection with real-time information. Communities participating in the project were selected due to their susceptibility to LRA attack and their lack of the communication infrastructure necessary to report and receive security information. A Local Protection Committee is established in each community to gather and disseminate information, provide regular maintenance to the equipment, and to ensure that trained operators in each community are carrying out the daily reporting. This project connects communities with local and international humanitarian groups, ultimately allowing for heightened humanitarian response while limiting the LRA's ability to attack without warning. Through Invisible Children's support, as of March 2012, there are 27 communities linked into the HF Early Warning Network in Haut and Bas Uele. FM radio is one of the few ways to directly reach LRA combatants across Central Africa with messaging encouraging them--many of whom are unwilling combatants--to escape. Invisible Children partnered with UN DDR/RR and Interactive Radio for Justice (IRfJ) to increase the capacity of Radio Zereda[http://vimeo.com/34053425], a community-run FM radio in Obo, Central African Republic, from 1km to an over 30-km radius. Through locally-produced radio programming, members of the victims' association in Obo and cultural leaders from LRA-affected regions share insight and sensitize local populations to the LRA's activities. In conjunction with sensitization, programming directly targets nearby LRA groups and is broadcast in both the local Pazande and Acholi languages to encourage and give instructions for peaceful surrender. In 2011, Invisible Children also provided support to repair Radio Rhinoceros in Faradje, DR Congo, and provided monetary support for a DDR/RR (Demobilization, Disarmament, Repatriation, Resettlement, and Reintegration) mobile FM unit deployed on rotation in Haut Uele. Additional community-FM projects in Haut Uele and in the highly remote and vulnerable district of Bas Uele are being identified and assessed for support during the 2012 calendar year. The LRA Crisis Tracker is a real-time mapping platform and data collection system created to bring an unprecedented level of transparency to the atrocities of the Lord's Resistance Army. Using information sourced from Invisible Children's Early Warning Radio Network, UN agencies, and local NGOs, this tool allows for better response from governments, policymakers, and humanitarian organizations. This joint project, developed by Invisible Children and Resolve, marks the first time data surrounding the crisis has been comprehensively aggregated and made publicly available. As abductions continue throughout Central Africa, Invisible Children is partnering with renowned LRA-trauma specialist, Els de Temmerman, and the leadership of CDJP-Dungu, to establish the first trauma-focused rehabilitation program in the LRA-affected regions of northeastern Congo. Invisible Children, using its construction expertise from our education programs in Uganda, built the center with local labor and largely local materials. The center, located in Dungu, is locally managed and provides one-on-one counseling, utilizing a variety of therapy approaches adapted to each youth, including UNICEF-approved Narrative Exposure Therapy (NET). The center provides vocational and life skills training, school catch-up programs, and reunification services. Upon completion of the second phase of construction, the center will have capacity for up to 250 children and youth to reside at the center where they receive holistic counseling services, which are also available for less-severe outpatient cases. Currently, a limited number of severely traumatized children are receiving treatment while the center builds staff capacity and develops systems. Full capacity is targeted for Fall 2012. Program management coordinates with both local and international NGOs and UN agencies to ensure that the center's activities are utilized by, and fit within, the regional psychosocial and protection strategies. Invisible Children Uganda is a non-governmental organization dedicated to improving the quality of life for war-affected northern Ugandans by providing access to quality education and improved livelihoods. We are committed to supporting communities affected by the Lord's Resistance Army by empowering local leaders to design and implement sustainable development programs that have a positive impact on the communities they serve. The scholarship program provides fully paid, merit-based scholarships and mentoring from local, full-time Invisible Children Mentors. Students are selected based on academic potential and level of vulnerability. Our Mentors provide academic support and counseling, with the intention of encouraging academic excellence and raising the next leaders of northern Uganda. This program partners with 11 secondary schools in northern Uganda and their surrounding communities. This involves building and renovating school structures and investing in teacher training. The program also facilitates a yearly Teacher Exchange Program that benefits both Ugandan and international educators. The Livelihood Program takes a holistic approach to providing sustainable economic growth and improved livelihoods for war-affected northern Ugandans through a three-pronged approach. Members of rural communities 1) save and loan money to one another through Village Savings and Loan Associations (VSLA); 2) benefit from access to clean water and improved health and sanitation practices through the Water, Sanitation, and Hygiene (WASH) program; and 3) receive training on numeracy, reading, and writing in their local language as a part of Functional Adult Literacy (FAL) program. Mend [http://www.mend.co/] is a social enterprise geared toward facilitating financial independence and development for vulnerable women in northern Uganda. These women, all directly affected by the LRA-conflict, produce high-quality bags that seam a personal connection between products, their makers and consumers. In turn, each seamstress receives a steady income and savings and investment training, as well as counseling and health and life-skills training from a full-time, local social worker. Invisible Children is built on the values of inclusiveness, transparency, and fact-based discourse. We ask no one to just take our word for it. We WANT you to see everything we are doing, because we are proud of it. But we also want to motivate you to act – not just watch. Our programs are carefully researched and developed initiatives by dedicated members of the local community that address the need for quality education and improved livelihoods – all necessary to restore and rebuild communities affected by conflict. Also, we have invited you to join us on www.LRACrisisTracker.com, which we established as a way to bring you near real-time reports from the ground, making available to the public the same information received by humanitarians working on the ground. But credibility in the eyes of policymakers, fellow non-profit workers, LRA-affected communities, and YOU is our most important asset, so we would like to encourage you, if you have critiques, to get specific: find facts, dig deeper, and we'll gladly continue the conversation from there. If encountering something you disagree with, suggest an alternative to what we are doing, and we will absolutely take heed. If it's a matter of opinion, taste, humor, or style: we apologize if people take offense, and will have to agree to disagree. As the poet Ke$ha says, "We are who we are." Joseph Kony needs to be stopped. And when that happens, peace is the limit. This is the beautiful beginning of an ending that is just the beginning. We are defending tomorrow. And it's hopeful.